For many kids who grew up in Chicago, the Museum of Science and Industry in Jackson Park housed the ultimate model railroad display layout: the 50-by-60-foot O scale “Museum & Santa Fe Railway.” It was a magnificent work of art, and for 60 years, it kept children and their parents coming back to the MSI. As I point out elsewhere on this site, it was literally years before I ever got past the trains to see the rest of the museum; in a much different time, my parents knew they could leave me at the train layout, check out the rest of the exhibits, and find me in the same spot, still watching the trains, when they returned. The M&SF story is both fascinating and sad. It is also the story of a remarkable model railroader, Minton Cronkhite, who built the massive layout essentially singlehandedly. Cronkhite was an avid model builder who, by the time he was 40 in 1928, had sold a successful business and made enough profit that he could pretty well become a full-time model railroader. He was also a ham radio operator, which required electronic skills that doubtless applied to model railroading as well. Cronkhite was modeling the Pennsylvania Railroad in 1928, when he displayed a large exhibit in O scale (most likely Q gauge, which I’ll explain in a bit), called “The Miniature Fair of the Iron Horse” in Greenwich, Connecticut. Around that same time, Cronkhite teamed with neighbor H. B. Vanderhoef and Carl Otto Nowack to open Crovan Scale Models, which manufactured O scale trains. A 1932 fire destroyed the company’s building, and with it, the business. Cronkhite moved to San Marino, California, fell in love with the Santa Fe Railway, and began building layouts based on it. The first was a 110-by-30-foot home layout, the San Marino & Santa Fe, which he constructed in an outbuilding. The hobby was in its infancy, and this was a time before you could buy much in the way of model trains or accessories in stores (although mail-order outlets like Crovan were around). Cronkhite scratchbuilt almost everything himself, including 300 cars and 3,000 feet of track. The SM&SF was Q gauge. He routinely worked with it. The trains were scaled ¼”-to-the-foot, which is correct for O scale, but the rails were spaced 1-3/16” apart rather than the O gauge standard of 1-1/4” apart. This is a more precise track gauge (4’8” vs. 5’ track gauge), but it meant he would have to handlay all his track and scratchbuild trucks for his rolling stock. And, in a major departure for the times, he did not use the typical outside third rail found on most O scale layouts. 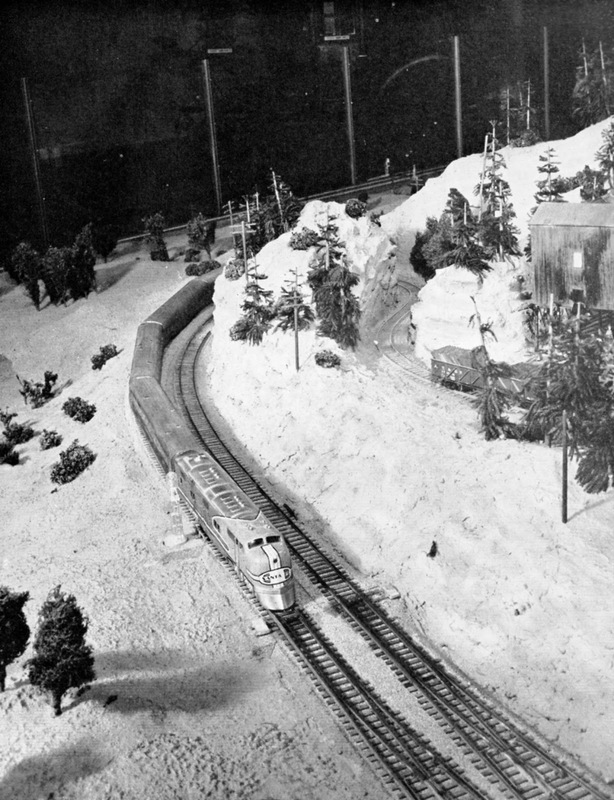 The management of the real AT&SF Railway got wind of Cronkhite’s work, which Model Railroader magazine publisher Al Kalmbach called “the finest individually built and owned model railroad in the country.” The railroad began paying for him to build temporary display layouts for various major events. These included the 1933 Chicago Century of Progress; the 1935 California-Pacific International Exposition; the 1937 Texas Centennial Exposition; and the 1939 San Francisco World’s Fair. The fact that these were temporary layouts did not mean Cronkhite skimped on them. Each was carefully detailed and featured working signal systems. As a matter of course, he built his models directly from ATSF shop blueprints. Santa Fe management was very impressed with his work. In 1937, Time magazine said, "The finest model systems in the U. S. are credited to Minton Cronkhite of San Marino, Calif., who rides in the cabs of real locomotives whenever he can." So, when the railroad decided in 1939 that it wanted to have a permanent Santa Fe layout exhibit at the Museum of Science and Industry, Cronkhite was their man. The railroad management gave him a $58,000 budget on a handshake, and Cronkhite got to work. He designed a double-track inverted and folded figure-8 track plan that took up a 2,940-square-foot piece of real estate. The layout was 30” high, which I recall being perfect for me to be able to see the trains close-up as a kid. It sat in an area surrounded by a balcony for an overhead view, which was critical, since some great scenery—like a model of the Grand Canyon—was literally 20 feet away from any angle if you were on the ground floor. The scenery was plaster, five tons of it, over a wood-and-metal frame. He allowed a goodly amount of open space, which would later be used to add new features. A 1941 shot of a train passing California palms. Some of that wiring, incidentally, was installed by his eight-year-old son William, who had become a proficient solderer. Cronkhite also built 12 locomotives, 14 passenger cars, and about half of 60 freight cars. The steam locos, nine of them, were made of cast brass and weighed 16 pounds each. The diesels, F3s to pull the Super Chief passenger train, were notable because the Warbonnet red paint was actual Santa Fe paint, which Cronkhite insisted on for a proper color match. Half the passenger cars were streamlined, for the Super Chief; the others were heavyweights, for the Grand Canyon Limited, headed up by a 4-8-4. The passenger cars, made of a metal known as Monel, cost about $18 each, the freight cars about $9. Lobaugh Scale Models of California built about 30 of the freight cars. The cars all had Bakelite wheels and non-operating couplers, and every car was lettered for ATSF. Strangely, the track switches all appear to be working models, and the early trains were limited in length to fit sidings, but there's no word on whether anyone ever used the turnouts. Similarly, much was written about the layout's control panel, which looked like the real thing, but considering the fact that the exhibit was automated, we don't really know what use the controls might have served. 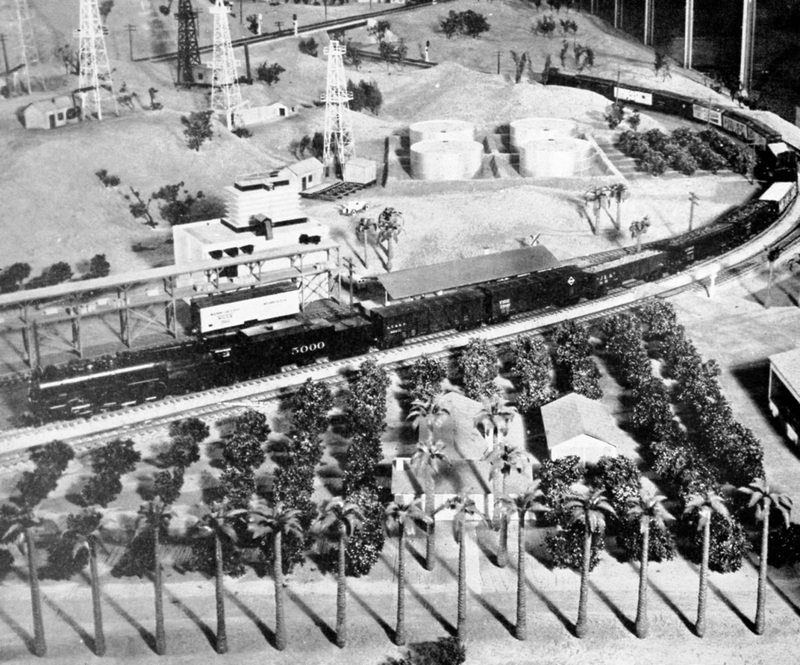 Cronkhite’s layout depicted the U.S. from Chicago to Los Angeles—everywhere the ATSF went—and included an oil field, mines, ranches, grain elevators, and a yard with various railroad facilities like a car shop (recycled from an earlier display layout), turntable and roundhouse. Trains rolled through orange groves, cotton fields, mountains, and past the Grand Canyon, painted by well-known western artist Hanson Puthuff, and the Santa Fe station on the South Rim. side for (relatively) close-up viewing. Cronkhite designed an ingenious automated system to run four trains (two on each main) without having to worry about them colliding, despite the primitive electronics available at the time. The relays that made this possible were linked to the operating signals, which provided endless hours of entertainment as they cycled through the colors while trains passed. Trains ran at a scale 60 mph if they had a green, 40 mph on a double-yellow, and 15 on a single yellow. They would stop on red, which meant a train was in the electrical block directly ahead. The exhibit was built on a steel frame surrounded by one seamless piece of Budd passenger-car fluted stainless steel. Glass kept the visitors from touching the models. The Museum & Santa Fe Railway opened to the public in January, 1941. From 1989: New hump yard in upper center, added 1953. Despite years of Amtrak, the Super Chief appears middle center. Because the exhibit was supposed to show off modern railroading, the Santa Fe ensured it kept pace with the real world. In 1953, it was shut down for a time and re-built (or “freshened up,” depending on who you ask) by Bob Smith, who owned Central Locomotive Works. The Q-gauge track was replaced with standard O gauge. Smith added an automated hump yard, removed the steam locos and replaced them with diesels, and took out the roundhouse and water tank in favor of a diesel shop. 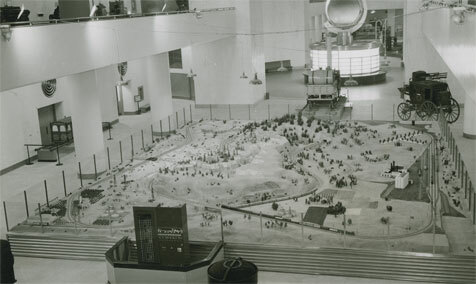 When the Santa Fe began to operate the cross-country bi-level El Capitan passenger train, a model of the new streamliner went onto the exhibit. Around 1989 renovation. Note flextrack is not ballasted. Minton Cronkhite died in 1971. 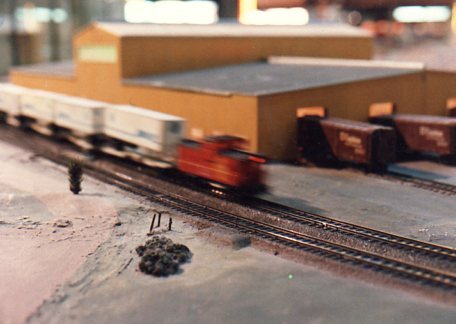 A second renovation took place in 1988 and 1989, when the railroad and the museum turned to suburban Chicago model railroad manufacturer Circuitron to update the layout and its technology to current standards, including a demonstration of computer dispatching. Circuitron's Steve Worack proposed and headed up the effort. A major undertaking, it required rewiring the entire layout. The cost: over $200,000, paid by the Santa Fe. It took over a year to rework the scenery, replace 1,200 feet of track and add the new control systems. Rolling stock that reflected current railroading was added, too. New stations went in, and, to make room, a portion of the Grand Canyon had to go. The M&SF roster included 12 new locomotives and 135 cars, with only a few holdovers from the last update. It took 300 hours of labor to finish the renovation, including efforts by about a dozen local hobbyists recruited by Don McWhorter, owner of an area hobby shop. Worack's own mother built 3,000 new trees. New cars were scratchbuilt by Barney Steumpfel, a 73-year-old model railroader, who used a vacuum-forming process. Steumpfel's story is interesting all by itself. A lifetime model railroader who had built handcrafted brass models, his vacuum-forming technique involved actual household vacuum cleaners, three of them, ganged together. The model builders knew they were working on a piece of history. "It's been a real honor," McWhorter told the Chicago Sun-Times. "I used to come here when I was a grammar-school kid. The first time I walked onto the exhibit, I couldn't believe it. It was a dream come true." The M&SF was back in business in April 1989, after a preview for ATSF officials, and Worack and company continued to add tweaks for a while afterwards. After having moved away from Chicago, I got the chance to re-visit the layout in 1989. I was surprised at how lightly-detailed the structures and scenes were; they were clearly designed to be viewed from a considerably distance. (An exception was the locomotive shop, which was intended to be scrutinized and was placed near the edge of the layout). Also, having by this time become a fairly proficient modeler, I was amused to realize that the scenery was zip-textured, the norm for the times. No ground foam here! A Kodakchrome diesel hustles Santa Fe Fuel Foilers through the desert in 1989. There were just two trains running when I saw the exhibit in '89, and they were notable: One was the Super Chief, pulled by Santa Fe F-units; apparently in this world, Amtrak had never happened. While there was no sign of Amtrak, the freight train was headed by a GE diesel in the short-lived "Kodachrome" pre-merger paint scheme. I wondered what would have happened to the layout if the Santa Fe and Southern Pacific merger had gone through. Would the ATSF rolling stock been joined by SP cars? Or, like Amtrak, would it have been ignored? The 727 hangs over the Cronkhite layout in background. In 1990, the railroad turned over ownership of the layout to the Museum. The management team began making plans for what they called a “Transportation Zone,” and after procuring an actual United Air Lines Boeing 727, decided to suspend it from the ceiling over the layout. Visitors would be able to go inside the aircraft via the second-floor balcony. Trains, it seemed, did not fit into the new “MSI 2000” plan, and, by April 1993, rumors began to circulate that the M&SF was going to be eliminated. The Sun-Times quoted an unnamed museum insider, who said, “They may keep the trains, but whether they will be displayed like they are now…it hardly looks like a 2000-type museum exhibit, does it? There was some discussion amongst Windy City politicians that Chicago itself was not even represented on the M&SF. The MSI spent another $100,000 trying to make the layout right—replacing track and wiring—mostly to no avail. "We had a lot of people come in and look to see if we could restore and modernize it, but everybody concluded it was no longer repairable," John Llewellen told the Tribune. "Its infrastructure was shot. The topography was beaten up and dog-eared from decades of people climbing on it for cleaning and repairs." 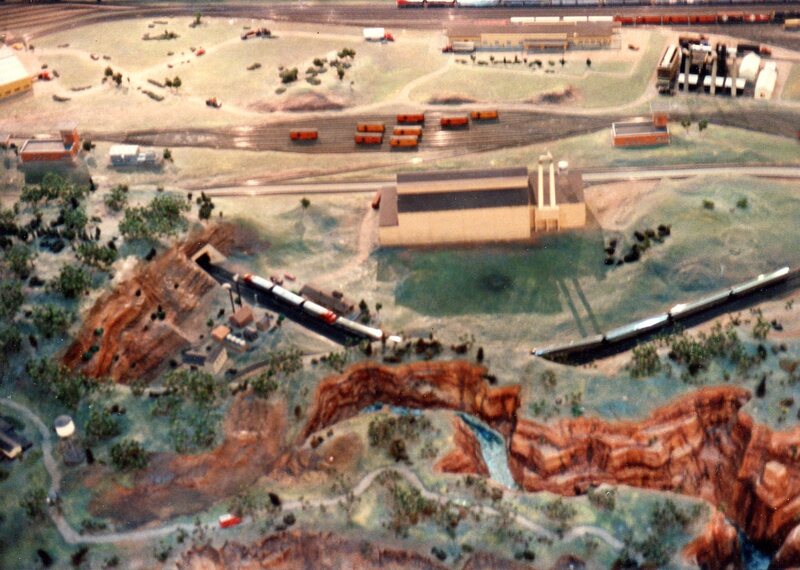 Finally, in 2002, the museum gave up, shut it off and announced plans to replace the M&SF with a $3.5 million BNSF-sponsored HO scale exhibit, called “The Great Train Story,” built in a massive effort spearheaded by Llewellen. A very detailed representation of the City of Chicago is a highlight of the layout. “The museum has nothing left (of the M&SF) but a square yard of plaster with Mr. Cronkhite's signature on it,” Harrison said. Without fanfare, in the summer of 2002, the exhibit's surviving items — several original buildings, rolling stock (both used and surplus), and pieces of scale scenery — were placed into forty lots and sold in an eBay auction. The auction generated over $21,500 for MSI. Here's one of Cronkhite's original structures, which was back up for auction recently. The price? $350. The description said, "This house was located in Reedville, the city in the northeast corner of the layout. Building is made from 1/4 inch wood with a fiber veneer. The windows are translucent plastic and the building appears to have been illuminated from the interior." Not much detail, as I mentioned earlier. 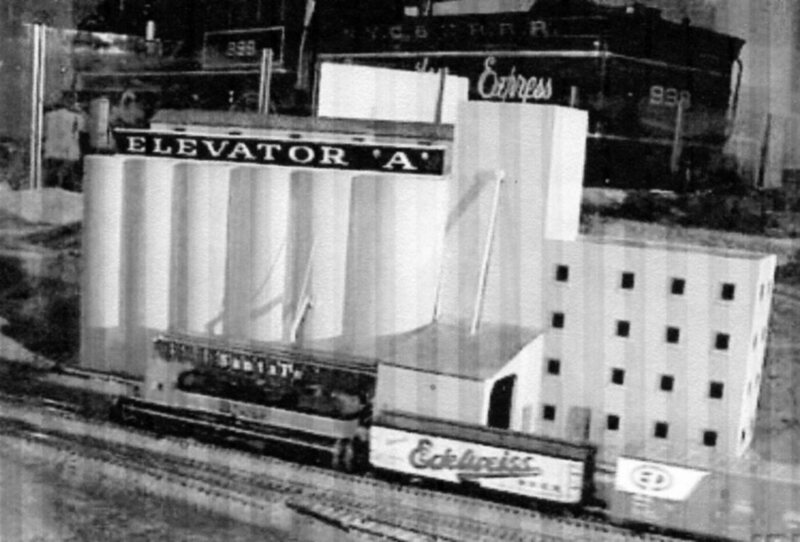 The single structure that sold for the most was the Grain Elevator "A" which had enjoyed a prominent spot on the layout for its entire life. It went for $1,036. “You'd be surprised how much people would pay for a memory,” Harrison said. Those of us who knew the Museum & Santa Fe wouldn't be surprised at all. One minor error. The wiring assistance in 1939 was not from William, but from Minton's elder son, Minton Brewster Cronkhite, my father. William was only 5 years old in 1939. I have fond memories of seeing this wonderful model railroad when I visited the Museum as a child in the 1940's and 1950's. It was incredibly well done and, like many others, I spent much of my time in the Museum watching it run. Another minor error: my grandfather Jack Parker, a master model maker in his own right, was hired by Mr. Cronkhite in the mid-30's to help with all of his model and landscape construction. As talented as he was, it's incorrect that Mr. Cronkhite constructed everything himself. Mr. Parker accompanied Mr. Cronkhite to all of the major exhibitions mentioned. His Santa Fe business and I.D. Cards, as well as photos of him working on landscape construction, and together with Mr. Cronkhite, are now part of my family photo legacy. Oh yes. I remember seeing the layout back in '95. I think. I was pretty young then. I remember seeing the layout several times as a kid back in the early 1970's when I lived near Joliet. I don't remember much about the other exhibits at the MSI, but that layout with its streamlined passenger trains and animated scenes are etched in my mind. Thank you so much for this wonderful article. I was in elementary school back in the 50's and probably the only little girl from the South Side of Chicago, who could stand motionless for hours, shoulder to shoulder with all the other train-addicted boys, as parents simply gave up on dragging us away. When I was maybe 11 every Saturday my father would drop off my younger brother and me at the MSI ( yeah then you could actually do that!) I would look down at the layout from the balcony with a ear-speaker fixed to my ear and hear the description of the train moving thru each city. As the train passed signal towers, each tower would light up. I so wanted to have those towers for my home layout. So when they were auction off on eBay, I bought them all!!. Now after 60 years the Towers are on my layout. yet he was very bashful to hold my hand, however Kolkata escorts figured out how to do that. Copyright 2012 by Scott Orr. Simple theme. Powered by Blogger.